Confronting persistent budget stress exacerbated by health care costs, increasing from 11 percent to 17 percent of the city of Brockton’s budget over the past decade, and an unfunded OPEB liability of $693 million, the Massachusetts municipality turned to KTP Advisors for help. Thanks to the process that KTP Advisors ran, the city was able to reduce the cost of its Medicare supplement plans with prescription drug benefits, net of federal subsidies, from $437 per Medicare-eligible retiree per month to $331 per month. In addition, the city was able to transition the plan from self-funded to fully-insured, thereby eliminating the city’s risks associated with large claims. The plan year shifted from July 1 to January 1, so the city and its more than 1,900 eligible retirees were able to save $106 per month sooner than if the plan were to remain as a July 1, plan year. In total, this resulted in savings of approximately $2.4 million per year. Because Brockton’s retirees pay 25 percent of the cost, each will save more than $450 per year and the city will save annually in excess of $800 per Medicare retiree per year. This 24 percent reduction in total costs was accomplished without cutting benefits or shifting costs to retirees. Although many national Medicare providers were included in the RFP process run by KTP Advisors, the city ended up staying with its incumbent provider. Even though the city has transferred the risk to the insurer, it is getting the same benefits as before KTP Advisors got involved, but thanks to KTP it is paying 24 percent less. An independent actuary for the city of Brockton recently reported that KTP’s structural recommendations and competitive process reduced the city’s Annual Required Contribution (ARC) by $10 million and its OPEB liability by about $160 million. Facing a fiscal deficit, strict state regulations on benefits and impending GASB 45 requirements, in 2005 this municipality located in the northeastern Unites States turned to KTP Advisors for help in developing and implementing new Retiree Benefit Solutions©. For the city’s plan year, effective July 1, 2005, KTP negotiated a 1.2% rate decrease from the existing rate compared to the average 11.1% increase in the national trend for similar plans in 2005. 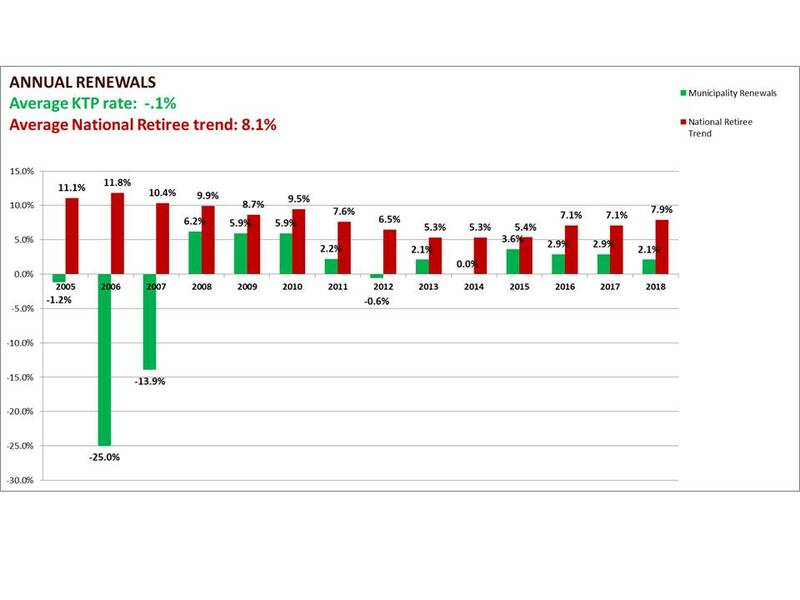 The 1.2% reduction is even more dramatic when compared to the renewal rate of the previous plan which, left unchanged, would have resulted in a rate increase of approximately 32% for 2005. These changes resulted in a 25% decrease in rates for 2006. During the renewal process for the 2007 plan year, KTP Advisors™ completed an RFP process that generated competing proposals from several different national medical and prescription drug plans. KTP was able to reduce the initial bids by an average of 18.2% through multiple rounds of complex negotiations.